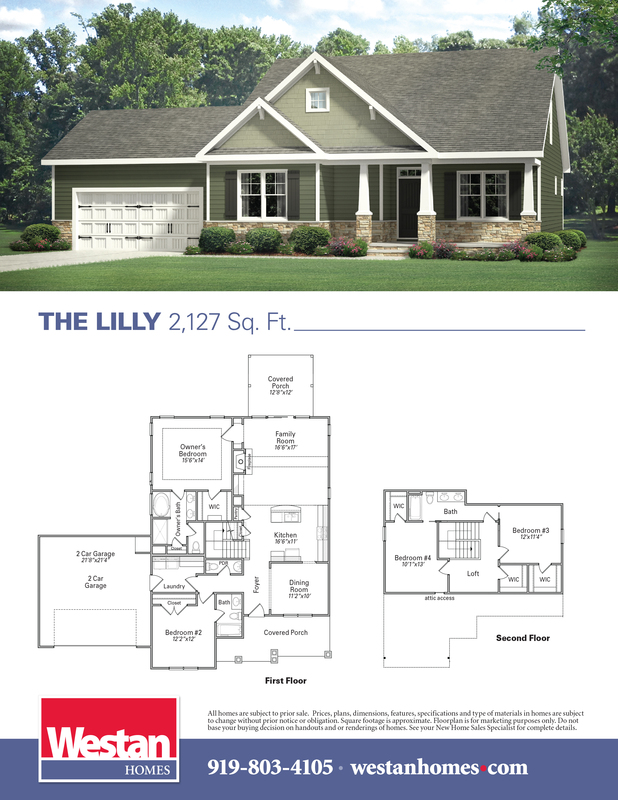 At Westan The Lilly has much to offer with 2,127 square feet. Open the door to your large grand foyer that features the formal dining to the side. Just to the other side of the foyer you will find a bedroom perfect for an In-Law Suite or teenage bedroom with its own full bath. The kitchen is a perfect open space for entertaining! With granite countertops, stainless steel appliances that include range, microwave and dishwasher. The center island is an ideal location for breakfast or the after school snacks! The kitchen is open to the spacious family room which features your fireplace. Just off the family room is the generously sized Owner's Suite with large walk in closet and bathroom that features separate tub and shower, dual vanities and private toilet. Finishing out the first floor you will find your laundry room and half bath. Traveling upstairs you will find loft space perfect for the home work station or home office, 2 full bedrooms that share Jack & Jill bath!